Bedding Information: 4 Kings/1 Queen/2 Twins/ Dbl. futon. Three Story Riverfront Cabin in the mountains of Ellijay, Georgia. Four Bedrooms, a Loft and three full baths. 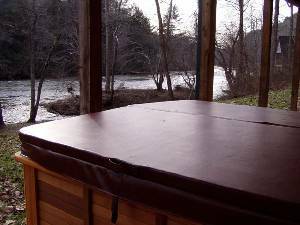 Our New Outdoor Hot Tub has the best river view.We now have DSL. Fishing rods and floats provided. Four outdoor covered porches looking over the river with comfortable lounge chairs, gas grill, outdoor table and chairs. Large picnic table by the river next to outdoor burning pit. 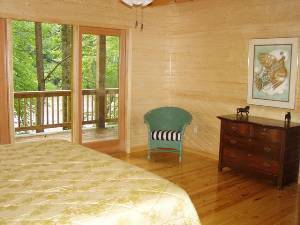 This awesome cabin has great river views, as it is situated right on the whitewaters of the 200' wide Coosawattee River. 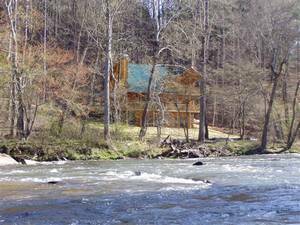 You can view the river from every room in this cabin! There are 2 master suites, both with king beds, and 2 large bedrooms with Queen beds, plus a loft bedroom with two twin beds all which open up to the river. There are 2 master baths, each with its own jacuzzi tub, separate shower and separate toilet room. The 3rd full bath has a combination shower/tub. Plenty of room for the kids to play in the back yard! 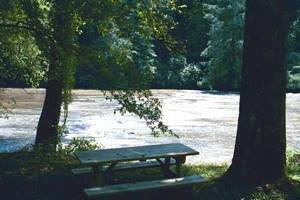 Enjoy the BBQ on the porch, while listening to the rushing waters of the Coosawattee River and dine on the picnic table near the edge of the river. There's fishing right outside your front door and fishing rods are provided! canoeing, kayaking, pontoon boat rentals (nearby Carter's Lake), horseback riding, train rides, waterfalls, antique shopping, hiking & biking. 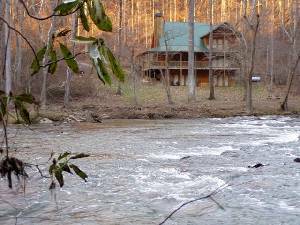 This mountain hideaway has it all! Our gated comunity amenities...enter the link abover. Tubing on the Coosawattee River Recreation Center includes: Tennis, basketball, olympic indoor swimming pool, kiddie pool, video arcade room & miniature golf. Teen center includes: outdoor pool, pool II includes: outdoor pool. Train rides on the Blue Ridge scenic railway waterfalls. Brasstown Bald - view 4 states from this mountain top. Fishing right outside your front door and rods are included! 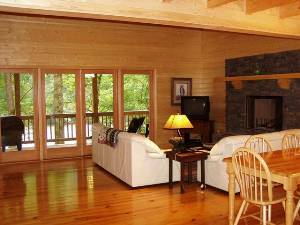 Enjoy the AWESOME views at River Edge Retreat! 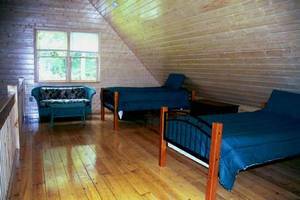 THIS CABIN IS AVAILABLE NOW $200.00 nightly and $1200.00 weekly * rates based on first 4 guests for non-peak. Each additional Guests $15 nightly / $90 Weekly. Stay 6 nights & get the 7th night free!!! (Entire Party). 2 night minimum, 3 night minimum most holidays. Children 2 & under stay free! Call for holiday rates & required length of stay. Deposit: $300 Security Deposit. We request a separate personal check for the Security Deposit. "Your" check will be returned to you within 10 days of your departure if no damage is found. Cancellations and Refunds: 28 Days Prior to Arrival - Full Refund. After 28 Days - No Refund. 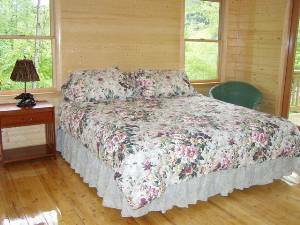 Weekly Stays & Holidays - 45 days prior to arrival.